Existing metal additive manufacturing systems use metal powders which are sintered and/or melted in enclosed chambers to fuse neighbouring particles to form the object in a layer by layer process. These processes, namely SLS, DMLS, SLM, etc., are efficient and offer a sufficient range of materials for 3D printing. But a novel technology developed after 10 years of rigorous research, MELD Technology, additively manufactures metals without melting the materials. Let us try to understand more about this new metal additive manufacturing technology, developed by MELD Manufacturing. Virginia-based tech firm Aeroprobe recently rebranded Additive Friction Stir, an additive manufacturing technology as MELD Technology. 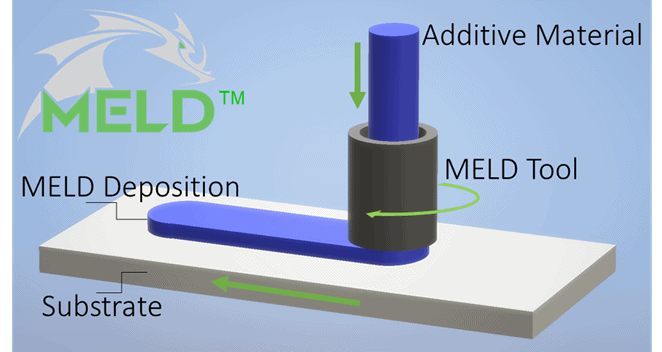 A Startup Company MELD Manufacturing Corporation, was formed and it now holds multiple patents for the MELD Technology. MELD technology is a unique patented metal additive manufacturing process where the metal is not sintered or melted. The first metal additive manufacturing technology which does not melt the metal to form the object. It is a solid-state process and hence has many unique advantages over the existing metal additive manufacturing processes. 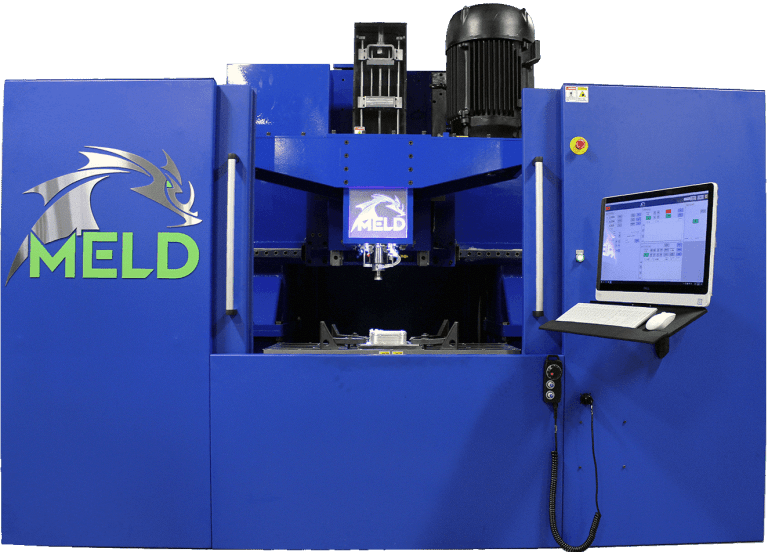 MELD manufacturing process is not an exclusively additive manufacturing technique as it offers additional capabilities like component repair, metal joining, and custom metal alloy and metal matrix composite billet and part fabrication and coating applications. MELD is surprisingly an open atmosphere additive manufacturing process. A first for metal additive manufacturing. It does not require vacuum chambers reducing the equipment’s and costs. Further it is scalable and can make bigger, better, and faster parts with a huge choice of materials. MELD produces fully dense parts and eliminates various defects and faults in current metal additive manufacturing processes. As other processes involve melting, problems like anisotropy, lack of fusion between particles, and other defects are often detected and MELD avoids and eliminates such defects. The MELD technology uses metal powders and/or rods as the base material. The machine uses a programmable robotic arm which holds and deposits the material. Unlike the existing AM technologies which uses laser beams to melt the metal, MED technology uses extreme pressure and friction to heat and deform the material into the desired shape. In some ways, the process is similar to FFF 3D printing process. This novel process is capable of manufacturing large metal parts not yet possible in metal additive manufacturing market. The speed and ease of use further benefits the technology and will help in rapid adoption of this technology.